Promotions in Vend Ecommerce – How can we help? Important: Promotions with Ecommerce are only available for retailers who are on our Advanced or Multi Outlet (or the latest Pro or Enterprise) pricing plans. 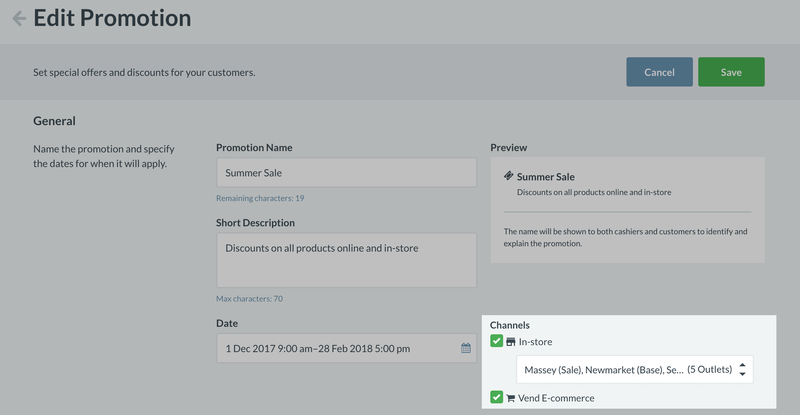 When setting up a promotion for the first time, you can choose to tick either In-store, Ecommerce, or both on the promotion creation screen. 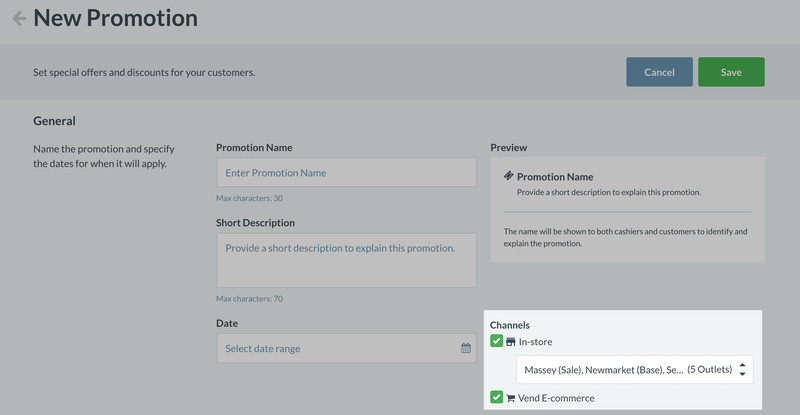 If you would like to enable an existing promotion on Vend Ecommerce, navigate to Products -> Promotions, click on the promotion you'd like to edit and click the Edit Promotion button. From here, find the Ecommerce tick box on the right and click it. This promotion will now be active in your Vend Ecommerce store. What promotion types are available on Vend Ecommerce? Both basic and advanced promotion types are available for Vend Ecommerce. To learn more about what advanced options are available, click here. Important: Promotions that target specific customer groups will not work on Vend Ecommerce. What happens to my product price points in Price books? Important: If you have experienced price book syncing issues in the past, we highly recommend you use promotions only. Promotions and pricebooks will compound in Vend Ecommerce if a product is part of both a promotion and a pricebook. Only Pricebook discounts will be displayed on the product collection page in your Vend Ecommerce store. Once these products are in the cart, you will see a combined total of the best pricebook and promotion discount. If you would like to run a promotion on products in Ecommerce, that are already part of a price book, we recommend editing the relevant pricebook and unchecking Valid on Ecommerce. How will this look on Vend Ecommerce? Your new promotion will now be applied to all relevant products in Vend Ecommerce but will not appear on the product collections page. If you are on the latest default ecommerce theme (Alpaca), promotions will appear to your customers on both the cart and checkout screens. From here, they will be able to see what discounts have been applied to the products and the adjusted total of their purchase. 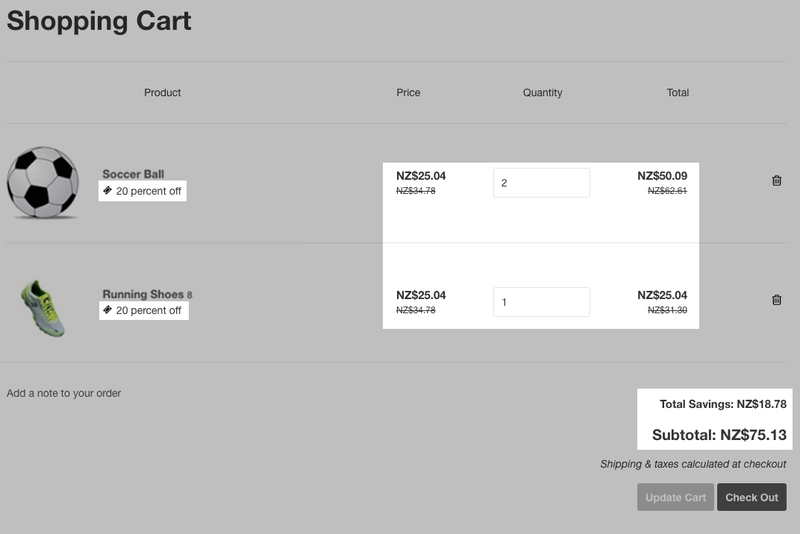 If you are on an older version of your ecommerce theme, your customer will only see the promotions on the checkout screen. To also show promotions in the cart, you will need to update your theme to the latest version. To learn more about how to do this, contact our support team.